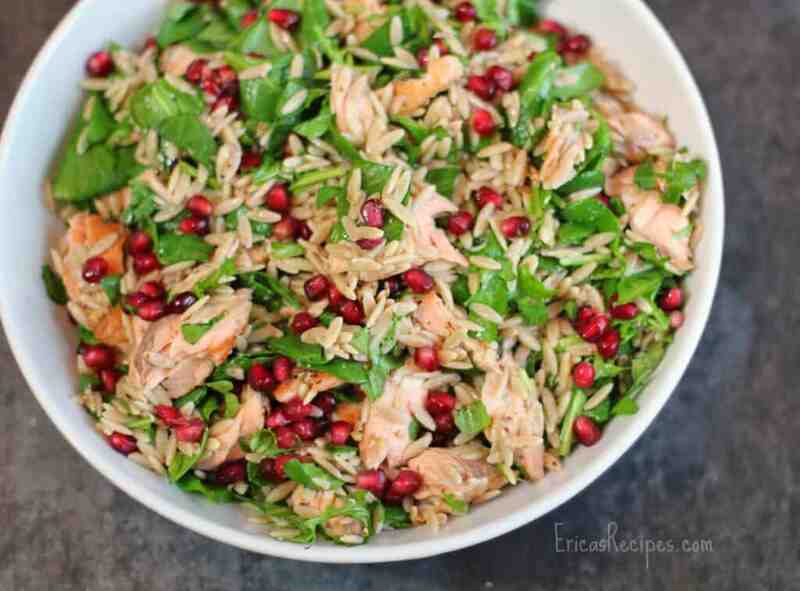 With greens, whole wheat orzo, pomegranate seeds, and salmon, this Orzo Power Salad with Salmon, Walnuts, and Greens has it all! Nutrition packed and SO TASTY, make this ahead and enjoy for your lunch during the work week. Meal prep made easy! It’s that time again! Final triathlon preparation! First up this year is the HITS Tri in Ocala, Florida, and my first attempt at Olympic distance (1500m swim, 24.5 mile bike, and a 10K run) YEEPS! Why do I do this to myself? Because I can …and how I got here is a cool story. I’ll write an article at some point and tell you all about it. I am now two weeks out from the event, so this is the time to really focus on nutrition. This week, I am increasing carbs and veggies, and maintaining my consumption of lean protein. Next week, I’ll cut out dairy (I’m a cheese-aholic, so I hate this part) and up the carbs even more. Also, I gave up alcohol for Lent, so that one took care of itself already. Why do I want to start increasing my carbs this far out from the race? Because proper “carb-loading”, i.e. topping off the glycogen tank, takes time. Also, I am still working out pretty hard this week, and I need to replace that spent fuel effectively. So anyway, about this recipe …holy healthy batman! 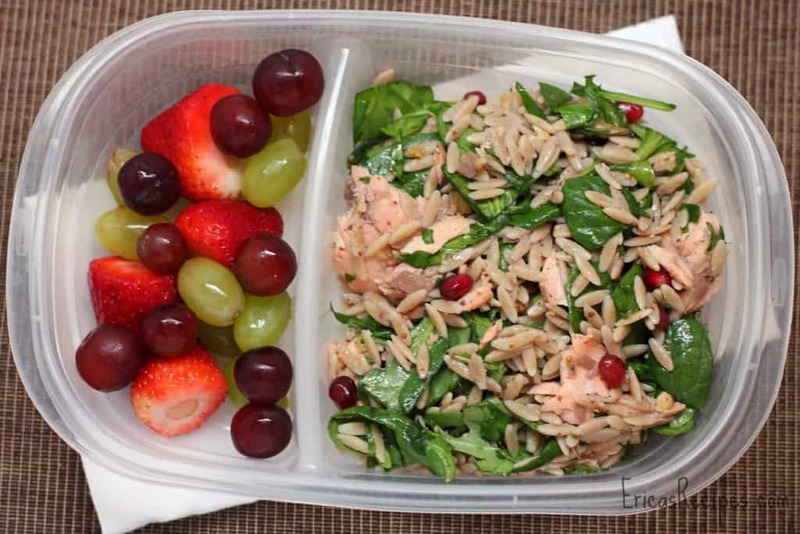 Could this Orzo Power Salad with Salmon, Walnuts, and Greens be any healthier? First we’ve got whole wheat from the pasta. Then we’ve got important fats and protein in the salmon and walnuts. Loads of vitamins and antioxidants in the greens and pomegranate seeds. And it’s all pulled together with a light and fresh lemon-Dijon vinaigrette. One serving comes in at a perfect 320 calories with 25g protein. Add some more veggies or fruit on the side with a cup of metabolism-boosting green tea, and you’re all set for a satisfying lunch you can feel so good about. 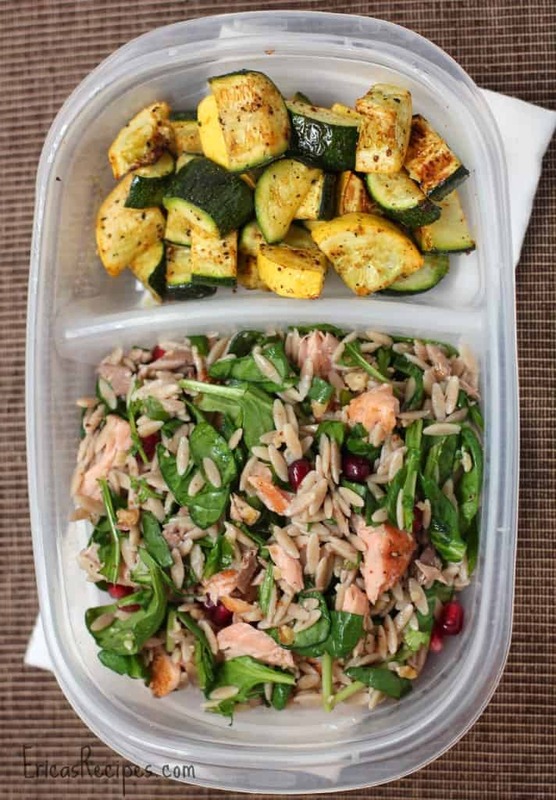 This Orzo Power Salad with Salmon, Walnuts, and Greens is the seventh installment in my Healthy Week: Lunches series. I tend to splurge on the weekends and then eat super healthy during the week, so making my lunches and portioning them out in advance helps me stay on track and is a huge time-saver during the busy week. Check out my other Healthy Week Lunches! Place the salmon on a rimmed bake sheet and season with salt, pepper, and Old Bay. Bake 15-20 minutes until just cooked through (a little undercooked is preferable to overcooked salmon - it'll finish cooking through while it rests out of the oven). With a fork, flake the fish into large, bite-sized chunks. Discard the skin. Cook the orzo in heavily salted water according to package directions. Drain. In a large bowl, whisk together the Dijon, olive oil, and lemon juice. Add a pinch each salt and pepper. Mix in the orzo and walnuts. At this point, let the pasta cool a bit if necessary so the greens don't wilt. Taste for seasoning (will need a bit more, like ~1/4 t or more). Gently toss in the salmon, greens, and pomegranate seeds. Serve warm or chilled. Yield: 5 servings. Love the Pomegranate seeds! The texture in this salad must wake your mouth up! Great Lunch anytime of year!!! Great post Erica!!! Love it! Such a pretty salad and I bet it tastes great too. Thanks for sharing at Simple Supper Tuesday. This looks so yummy and healthy! I am pinning and trying it out! Thanks for sharing!